Victoria boasts almost 2,000 km of coastline with the Southern Ocean, Bass Strait and the Tasman Sea forming the southern border of the State. 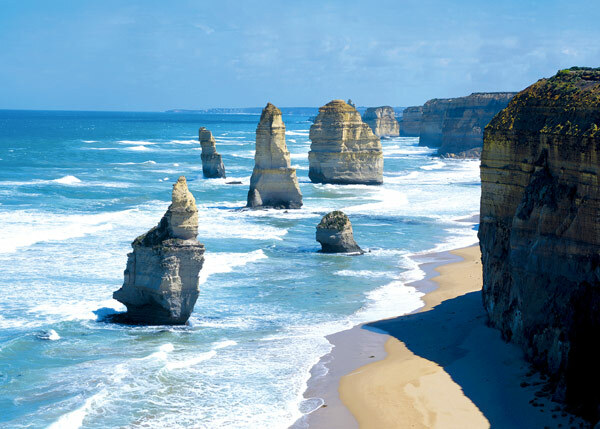 The Great Ocean Road is famous for the imposing beauty of the Twelve Apostles, whale watching and a history of ships being wrecked in its treacherous waters. The Murray River, Australia’s principal river, forms the northern border separating Victoria from New South Wales. In Victoria experience spectacular surf, desert, rainforest, mountains, and rugged coastal scenery, goldfields, vineyards, lakes, and magnificent rivers, wildflowers in Spring and snow in Winter. Native wildlife includes kangaroos, koalas, wombats, platypus, echidnas and lovable little penguins, which parade nightly along Phillip Island beach. From the cool-climate varieties of the Yarra Valley to the big reds of Rutherglen, you won’t have to travel far to taste fantastic wine in Victoria with over 350 wineries. Victoria’s capital, Melbourne, has an abundance of arts and culture, major events and festivals, fine food and wine, great shopping, cutting-edge fashion from Australian designers, lush parks and gardens, vast waterways, great architecture, friendly people and world class sporting events. Major events include the Australian Open Tennis Championships, Australian International Air Show, Formula 1 Australian Grand Prix, Melbourne International Comedy Festival, World Cup Aerials at Mt Buller Ski Resort, Australian Football League Finals Series, Melbourne International Arts Festival and the Spring Racing Carnival featuring Australia’s famed Melbourne Cup. The internationally-renowned Melbourne Cricket Ground (MCG), one of the world’s largest and most outstanding outdoor sporting grounds were hosts to the opening and closing ceremonies and athletics events of the Melbourne 2006 Commonwealth Games. For further information about Victorian Tourism click here. Click here to view details regarding Superyacht Marina at Melbourne Docklands. For additional information on what’s on in Melbourne click here.